Are you wondering and imagining about the Gobi desert in the winter, golden sands covered by white snow…Mongolian Gobi is not only famous for its beauty, camels, nomads, dinosaur findings but also it has been known as its winter scene. You can experience Mongolian Gobi in winter too. Thousand Camel Festival has been organizing for 20 years, by local camel herding communities under the purpose of protecting two humped Bactrian camels and increase income and productivity of local nomads through tourism. So colorful, uncommon event, attracts foreign and local travelers and culture lovers and has already been to famous winter festival in the world. Why Mongolians celebrate this festival? "Camel Festival," is already one of the most famous winter festivals in the world organized by a local non-governmental organization working to protect and preserve the Bactrian camel population, which has been steadily declining over the past twelve years. Umnugovi /South Gobi/ province leads Mongolia and the world by Bactrian camel population. To celebrate Mongolian camels and protect the species and pass the rich Mongolian camel breeding heritage to the next generation. Nomads from far and near wore their best traditional costume and ridden their best camels to attend the festival. 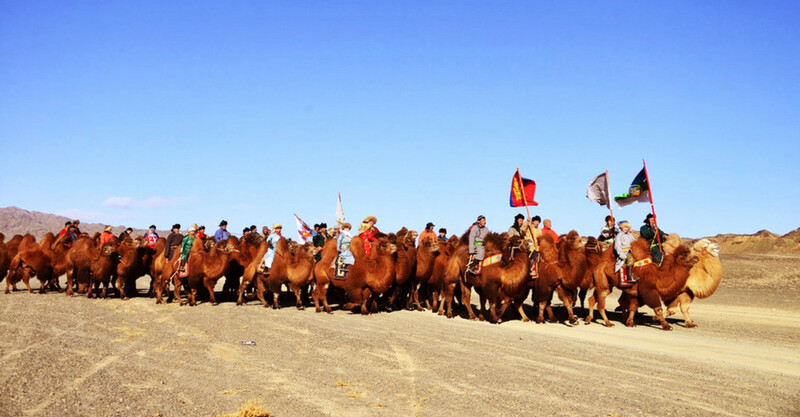 “Mongolian Camel-999” festival, Mongolia breaks Guinnes World Record, having organized the race of the largest number of camels. Total of 1,108 camels came to the finish line out of 1,115 registered to the race. The race was just over 15 km long with the fastest finishing in 35 min 12 sec and the whole race completed in 1 hr 8 min. The previous record for the largest camel race belonged to Inner Mongolia, China, where 555 camels raced in 5000 meters in 2011. What to see and do at the Thousand Camel festival? The Thousand Camel Festival starts with camel parade. During the festival, local camel herders compete in a race, camel polo tournaments, beauty contests are organized. It is not only the event of competition also, Mongolian musicians and dancers show off folk performances. One of the highlights of the festival is a female camel gave birth to a little colt on the grounds of this festival, which incident cheered the viewers, who took this as a good omen representing great increase in the camel population. You will also explore nomadic lifestyle and prehistoric sights on the trip to this festival and support the local community and helping the raise of Bactrian camels when you attend this event.